Thanks to its various direction and navigation features, the Maps app on your Android phone stands at the ready, waiting to be your copilot. It’s just like having a backseat driver, but one who knows where he’s going and — bonus — has a Mute option. Touch the Route icon in a location’s card. Choose a method of transportation. The available options vary, depending on your location. You can type a location or choose from one of the locations shown on the screen, such as your current location, your home location, or any location you’ve previously searched. Touch the Starting Location item to choose another location. Ensure that the starting location and destination are what you want. If they’re backward, touch the Swap icon. One or more routes are listed on the screen. Touch one of the cards to see the details, which are shown to the right in the figure. The map shows your route, highlighted as a blue line on the screen. To see a list of directions, touch the results card, shown at the bottom of the screen. You’ll see a scrolling list of turns, distances, and directions. Touch the Preview icon to get a bird’s-eye view of your route. The Maps app alerts you to any toll roads on the specified route. As you travel, you can choose alternative, non-toll routes if available. 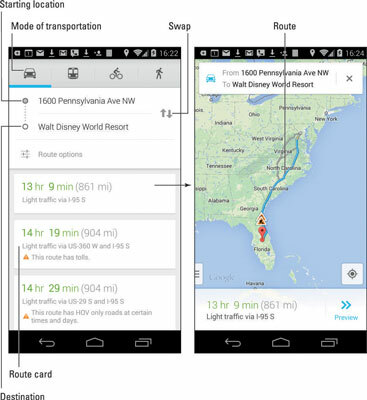 You’re prompted to switch routes during navigation. You may not get perfect directions from the Maps app, but it’s a useful tool for places you’ve never visited.